PEOPLE WHO DESCRIBE themselves as not religious are now the second largest grouping in the state behind Catholics, the census has found. Just under 270,000 people defined themselves as being of no religion, an increase of 44 per cent on the 2006 census. 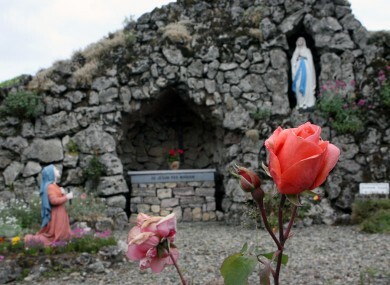 Ireland remains predominantly Catholic despite large increases in other religions in recent years. Just over 84 per cent of people – 3.86 million – define themselves as Roman Catholic, a slight decrease on the 87 per cent who did so in the last census in 2006. However the actual number of Catholics increased by almost 180,000 due to the overall population increase. Much of the increase came from non-Irish nationals with most coming from other parts of Europe. Eastern counties had the highest percentage of non-Catholics with the percentage declining towards the west of the country. Three counties had more than 1 in 5 of the population as non-Catholic: Fingal and Dún Laoghaire in Dublin, and Galway City. Offaly had the lowest percentage of non-Catholics with 8.6 per cent. The next largest religious grouping is Church of Ireland with 129,000 people (2.8 per cent of the population). The biggest increase was in people describing themselves as Orthodox, which grew by 117 per cent between 2006 and 2011. Apostolic or Pentecostal religions grew by 73 per cent in five years to around 14,000. The biggest non-Christian religion in Ireland is Islam, with 49,200 people defining themselves as Muslim in the census – an increase of over 50 per cent since 2006. Email “Census 2011: Surge in non-religious – but 84 per cent remain Catholic”. Feedback on “Census 2011: Surge in non-religious – but 84 per cent remain Catholic”.